[MARTHA WASHINGTON]. Portrait Signed by the artist (“Fabre”). 2¾ x 3¾ in. 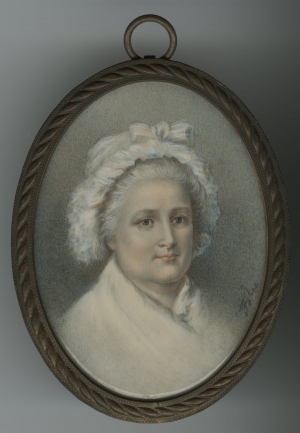 This portrait of Martha Washington, hand-painted on ivory, is likely by noted Swiss/French miniaturist Louis André Fabre (1750 – 1814). The French had a penchant for painting mid-nineteenth-century miniature portraits, including images of American historical figures, on ivory. This miniature is in its original frame and back insert. Though “Mère de Washington” (Mother of Washington) is written on the reverse, the image is clearly Martha.